"Ideal for centralized office use by multiple users in a department or company." The GBC 6020S Office Shredder - The 6020S shredder is suitable for all types of shredding applications. Shreds 28 to 30 sheets into 1/4in strips at a fast 25 feet per minute including staples and paper clips. Features SmartShred controls and Jam-Stopper electronics. The shredder has an auto on-off operation. Continuous-duty motor never needs a cool down period. Full size, 16in opening, suitable for all types of shredding applications from regular paper up to EDP-computer size paper. Large bag capacity lets you shred longer. 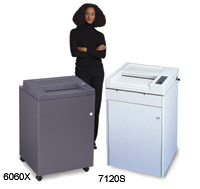 The shredder's bin-full indicator and reverse function insure trouble-free operation. SmartShred controls: Four visual indicators keep you informed - Power On, Bag-Full, Overload and Door Ajar. Jam-Stopper electronics: Solid one-piece cutters shred staples and paper clips without jamming. Bag-full sensor shuts off shredder before back-end jams occur. Auto stop on jam eliminates motor wear and tear. New! Exclusive in cabinet basket jog foot pedal. Convenient method to settle and compact shreds, allowing for longer shredding time between bag changes.